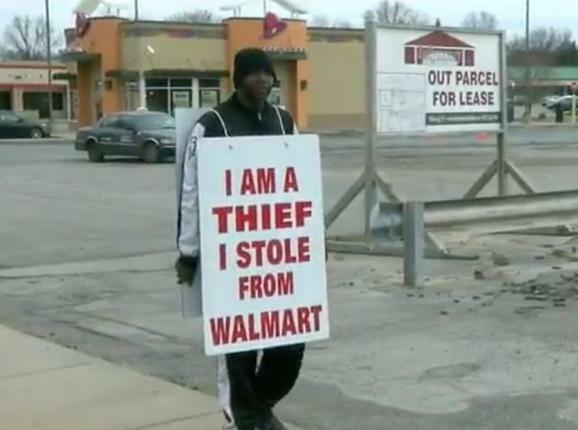 A judge allowed an Ohio man to wear a sign declaring that he is a thief in exchange for avoiding jail time. Greg Davenport of Liberty was permitted to hold a sign that read, “I am a thief. I stole from Walmart,” for eight hours a day for 10 days, in lieu of 30 days in jail. “I stole, I got punished. That’s it,” Davenport told WKBN, as he served the unusual punishment. Davenport was caught attempting to walk out of a Walmart store while carrying a 52-inch television. He had been charged with petty theft multiple times in the past, but Liberty Police Chief Richard Tisone said he hopes this kind of punishment can encourage him to change his ways. “Maybe you can get to their inner side. Maybe they’re a little embarrassed by the fact they have to hold a sign up, so it might affect some of these individuals, so I’m all for it,” he said. A monitor was assigned to check up on Davenport every hour to ensure that he was abiding by the terms of his punishment. He told The Vindicator that he is not embarrassed by having to hold the sign and waved at passing cars, as he admitted he’d just like to get the sentence over with. “It’s better than being in jail,” Davenport said. Previous articleRock Your Husband’s World With This 4 Tips Tonight!! !